Black Tea is made from the same plant as green tea and white tea. Black tea doesn't mean tea without milk, and white tea doesn't mean tea with milk. The difference is the way the tea leaves are processed after picking. Green and white teas are hardly processed at all, whereas black tea is fully oxidized. 1. Studies continue to show that tea is very good for you, and has some amazing health properties that cannot be ignored. 2. 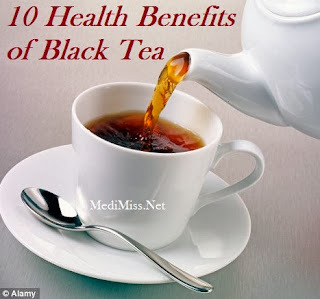 Black teas contain antioxidants which prevent the damage caused by free radicals which can lead to numerous diseases. 3. Drinking black teas can help to reduce the risk of heart attacks and strokes, as it helps to expand the arteries, which increases blood flow to the heart. 4. Research has shown the black tea can be used in the fight against cancer. Properties of the tea slow down the growth of cancerous cells without destroying healthy cells. 5. Tea is also believed to help to delay the aging process. Nowadays there are many anti aging creams and lotions that contain tea extracts to help the skin look younger. 6. Drinking black tea can help to burn fat and speed up metabolism. This makes it an ideal drink for those who are looking to lose weight, or who exercise regularly. 9. For those people with diabetes, drinking tea can help to decrease glucose levels, which can reduce the risk of cataracts, and other conditions brought about by diabetes. 10. Investigations have shown that the benefits of black tea are lessened when milk is added. So, in order to take advantage of the amazing health benefits of this tea, it's recommended that you don't take your tea with milk or sugar. There are so many different loose teas to choose from that you won't get bored. As well as black, why not try white and green tea? Many people don't make these sorts of teas properly, which is why some people don't like loose tea. By using a tea machine, you can ensure that you are getting the water temperature and the steeping time right, you can be reassured that you are getting the health benefits of black tea. Drinking just 3-5 cups of black tea daily can bring about all these health benefits. If you drink tea already, why not change to black or green tea, and see if that improves your health and well being. By starting to drink black, green or white tea today, eating healthily, and getting regular exercise, you can dramatically reduce the risks of serious medical conditions. If you're not currently a tea drinker, what are you waiting for?